A refractive error in the eye occurs when images are not focused precisely onto your retina by your cornea and lens. Refractive surgery to correct refractive errors, such as myopia, hyperopia, and astigmatism, is now available from Virginia Eye Institute for most people who want to reduce or eliminate their dependence on glasses and contact lenses. Through our complete screening examination, VEI will determine whether you are a candidate for LASIK. If desired, surgery can be scheduled within two to three weeks of your examination. The procedure takes about 20 minutes per eye, and you can expect significant improvement in your vision within the first 24 hours. 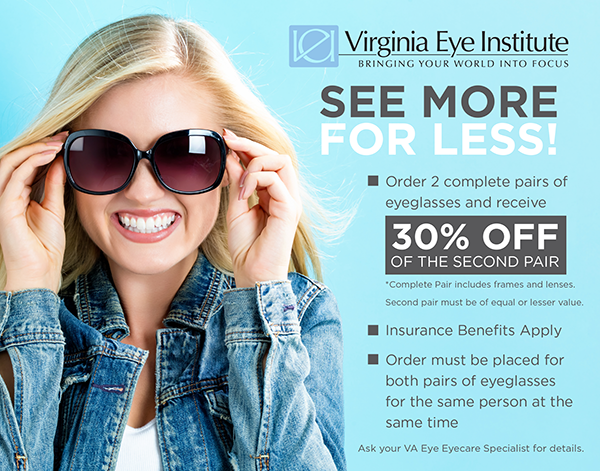 LASIK was first performed in Virginia on an FDA-approved laser by a VEI surgeon in 1996. Today, Virginia Eye Institute offers both conventional LASIK and custom LASIK with the bladeless IntraLase laser to precisely sculpt your cornea to correct refractive errors. LASIK surgery consists of two steps. During step one, your VEI doctor will create a corneal flap. In step two, the doctor will gently fold the flap back to perform the laser procedure that corrects your vision. With conventional LASIK, the corneal flap is created using a surgical blade called a mechanical keratome. The bladeless IntraLase Method uses tiny, ultra-precise pulses of laser light to create the corneal flap. One advantage of this method is that certain patients who were not previously eligible for LASIK may now be eligible using the IntraLase method. This technology may then be teamed with the precise cornea mapping of the CustomVue aberometer to perform LASIK treatment customized to your visual needs. Theodore T. Wu M.D., Ph.D.